We are excited to share this news: College of Business junior KJ Harrison and two more of his baseball teammates were named to the CoSIDA (Collegiate Sports Information Directors of America) Academic All-District 8 team. Our men’s baseball team is the only Division-I team across the eight districts to have three players selected. All three are in the running to become Academic All-Americans – the premier awards program in intercollegiate athletics for honoring combined academic and athletic excellence. We’ll hear about that in early June. Congratulations, and good luck! 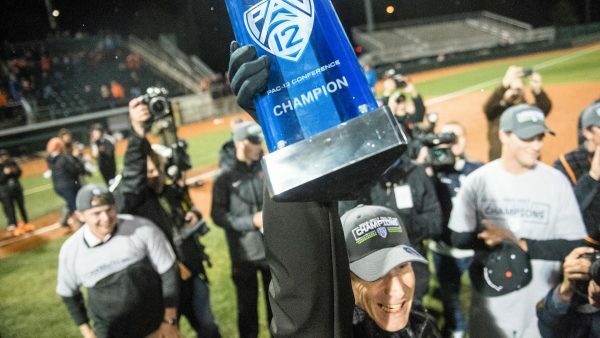 In more good news for Harrison, Oregon State baseball holds onto its no. 1 national ranking and clinched the Pac-12 title this weekend. Go Beavs! Fridays in Austin this week features entrepreneurship. Some of our outstanding Oregon State alumni will share experiences, including sales techniques for startups, crowdfunding campaign strategies, commercial real estate, venture capital, angel financing and more. Our speakers include John Stirek, President of Western Operations for Trammell Crow Company, technology consultant Dan Ellis, Bruce Carpenter from PGE, Jake VanderZanden with OTTO DesignWorks, Mike Hermens from Capgemini, and many others. The Marketplace will feature “Startup Central” company tables from local startups for a great opportunity to network and learn. Here is an important update for all design students: The course designator DHE will be replaces by DSGN. When looking for design courses during fall term registration, you will need to search for DSGN, in addition to DHE. DHE courses are equivalent to DSGN courses, and they will still fulfill your MyDegrees requirements. DHE will eventually be phased out, and all courses will become DSGN. Be ready: fall term registration begins May 21. More information about registering for courses, including how to look up your assigned fall registration day/time, is here. We also posted a narrative about what a good experience it is to become a “first friend” for international students entering the College of Business from abroad. They are recruiting for fall term so go online to apply. Finally, don’t forget to get your tickets for the 12th annual Oregon State Spring Fashion Show will be for in Milam Hall Room 224 from May 3 – 19, Wednesdays 2-4 pm and Fridays 11 am-1 pm, cash only. The show is Saturday, May 20 at the SEC Plaza. Doors open at 7 pm, and the show starts at 8 pm. Posted in AEP, Career Success Center, Uncategorized.